In a wok, heat the oil and stir-fry the rice with salt and pepper for 2 minutes. Dish out and set aside. 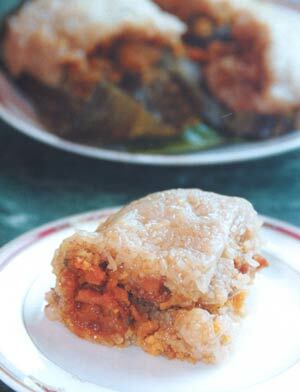 Unmould the glutinous rice and ingredients onto the leaves and wrap into parcel shape. Boil the dumplings for 5 hours over slow fire. Note : Makes 2 extra-large dumplings. For more food and wine stories and recipes, pick up the latest issue of [Flavours (May – June 2005)], Malaysia’s premier food magazine, available at major bookstores and newsstands or email cir.ccu@thestar.com.my for subscription details.